The factory riot that stopped production at Foxconn Monday may strike again, experts warn. Foxconn is one of the world's biggest electronics manufacturers, based in northern China, it's responsible for making popular tech products such as the iPhone 5 and the Xbox 360. The company has also been criticized in the media for poor working conditions and over extending its labor force. About 2,000 employee's rioted earlier this week injuring 40 people. The brawl briefly halted production in one of FoxConn's factories in the northern city of Taiyuan. The riot comes amid a slowdown in the Chinese economy and high demand for the newly released iPhone 5. Though the incident was sparked by a clash between guards and workers, experts warned in a Washington Post article that issues underling the riot need to be resolved or more disturbances may arise. "Such riots have become in some ways inevitable," Liu Kaiming, a labor expert in Shenzhen, told the Post. "It's no longer simply a matter raising the wages." Experts say a contributing factor is the changing demographic of the migrant workers who fuel China's manufacturing sector. These workers are becoming better educated and are looking for higher paying jobs elsewhere. So the labor pool is starting to shrink for these unskilled manufacturing jobs. Though the labor pool is evaporating, demand for tech products is as high as ever, putting more pressure on the remaining workforce. 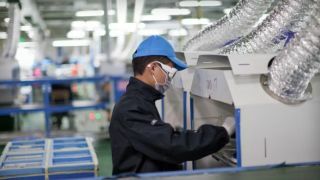 Back in March, a probe by the US Fair Labor Association found "serious and pressing concerns" as employees at a Foxconn plant were working overly long hours and weren't paid overtime. The report also said employees would often go more than 11 days without time off and work as much as 70 hours a week. Another problem is the intensity of the job. Workers are required to do very precise work in quick repetition. Workers also complained in the Post about poor management and abusive guards. One former employee said a problem was "spiritual emptiness" as they were discouraged from talking with one another. Apple's relationship with the electronics manufacturer came under fire in the past, as the company relies heavily on Foxconn as its main Chinese supplier. "Our team has been working for years to educate workers, improve conditions, and make Apple's supply chain a model for the industry," Apple CEO Tim Cook said when the FLA conducted its probe. Apple helped contribute to raising wages for workers and other minor reforms, but it doesn't seem to be enough, judging from recent unrest. And pressure is only going to build from the recent success of the iPhone 5 and the oncoming holiday season.